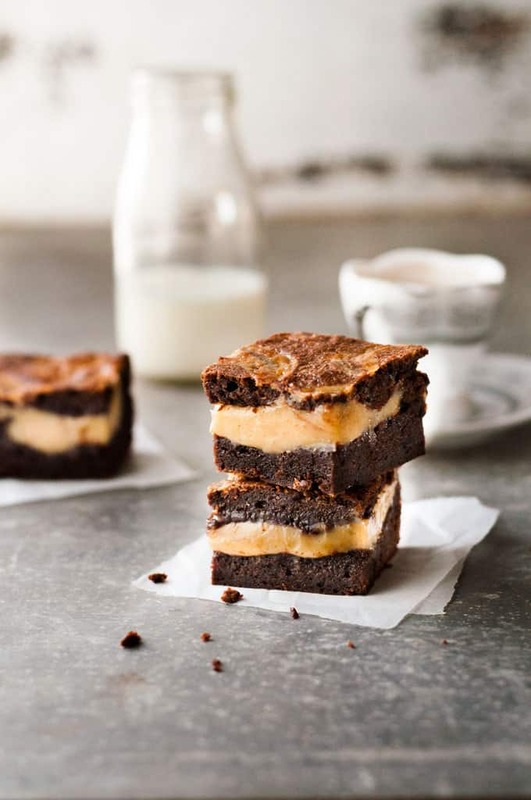 Salted caramel + brownies = heaven. This is made using a simple Australian way to make caramel from scratch. No candy thermometer, and the caramel soft sets rather than running all over the place. 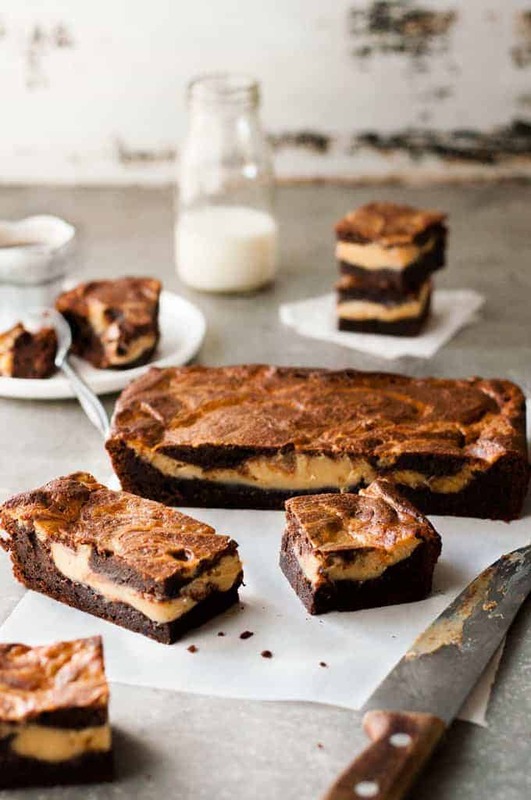 You need to make this Salted Caramel Brownies recipe this weekend. “Diet starts Monday”! 3. required a candy thermometer to get the caramel to the exact temperature so it would soft set rather than ending up runny OR cooking it too far so it ends up like hard toffee. While I do have a candy thermometer, it’s just not my style to use it for day to day cooking. And I very specifically wanted a soft layer of caramel inside the brownie rather than runny caramel drizzled on top. Like this. 🙂 Look at that thick, generous, SOFT layer of caramel….. I am a frustrating combination of a foodie with a stubborn streak. When I get an idea into my head of something I want to create, I get an unhealthy obsession to make it happen. If you only knew of the epic disasters my kitchen has seen…. 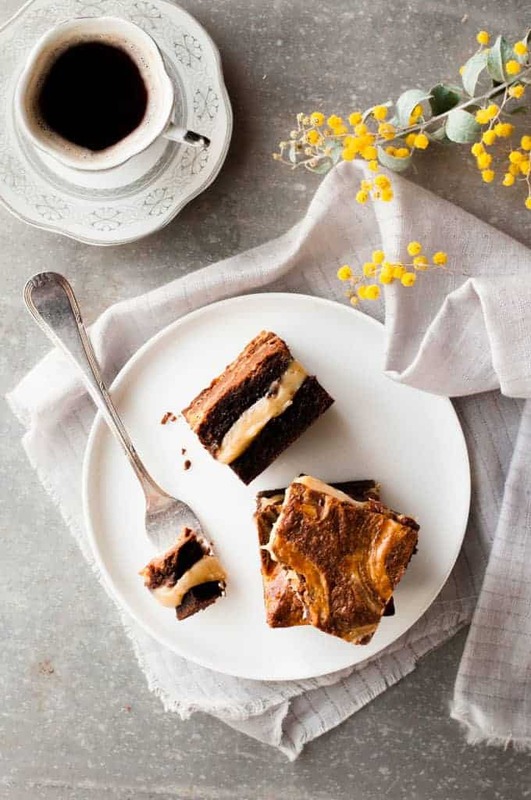 This Salted Caramel Stuffed Brownie is one such obsession. All I can say is that I’m thankful to have plenty of sweet-tooth friends who were happy to take the failed attempts, even when they were a complete mess. There was one that was such a mess it had to be eaten with a SPOON out of the PAN. Seriously! It proved impossible to create a neat layer of the caramel in the brownie, but I’m totally cool with that. It might not be the neatest looking slice in the world, but it tastes just as it should – indulgent, rich, gooey chocolate brownie with rich, smooth, soft salted caramel with a surface that has little bits of ever so slightly chewy caramel. Words fail me to describe how good these are. What are you waiting for? Get into your kitchen and make these!! Our diet can start on Monday! Caramel Slice (aka Millionaire’s Shortbread!) – the great Aussie favourite! A moist brownie stuffed with soft set caramel made from scratch. No candy thermometer required! The brownie is lovely and moist. Not too fudge like, not too cake like - something in between! Butter and line a 8 x 8” / 20 x 20 cm square tin with parchment (baking) paper. Place the butter and chocolate in a bowl placed over a small amount of simmering water in a pot. (Note 3) Leave it until the chocolate and butter are melted – about 5 minutes. Mix to combine until smooth, then remove the bowl from the pot and allow to cool slightly – 5 minutes. Add the sugar, eggs and vanilla extract into the chocolate and mix well to combine. Add the flour, cocoa powder and salt and mix until just combined. Measure out 1/2 cup of brownie batter and set aside. Pour the remaining batter into the prepared tin. Pour over the Salted Caramel, spreading it to cover the brownie batter. Dollop the reserved 1/2 cup of brownie batter randomly over the Salted Caramel. Use a knife or skewer to make “swirls” (see photo below). Leave to cool in the pan for 10 minutes then turn out onto a rack (Note 5). Once cooled, cut into 16 squares. Place the ingredients in a small saucepan over medium high heat. Stir occasionally for the first 1 minute, then when it is heated (when you see wisps of steam), whisk constantly (leisurely, not vigorously!) for 7 minutes. (Note 6) It should be a very pale golden colour. 2. Golden syrup is like a cross between honey and molasses – it is thick and sweet (but not as thick as molasses). It is mainly used for colour in this recipe so you can substitute with maple syrup, or even leave it out. 3. Get a pot and a glass or metal bowl that are the right size so that the bowl will sit in the opening of the pot without touching the bottom of the pot. Pour in 1 inch/2 cm of water into the pot and bring to simmer on the stove over medium low heat. Place the bowl into the opening of the pot, making sure the bottom of the bowl doesn’t touch the water. The heat from the simmer water will gently melt the chocolate and butter, ensuring that the chocolate doesn’t burn. Alternatively, you could microwave the chocolate and butter in 30 second bursts, stirring in between until melted and smooth. 4. 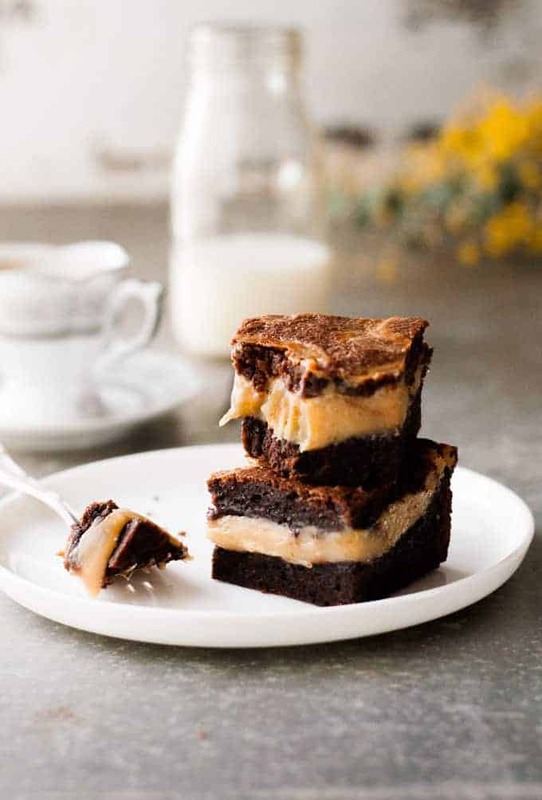 The baking time for this brownie is slightly longer than the time when you are making a plain brownie because of the caramel layer which means it takes longer for the brownie to cook. 5. This is how I turn out cakes from pans: place a cutting board on top of the pan. Flip it so the brownie comes out. Peel off the parchment/baking paper. Place a cooling rack on the base then flip it again. Then the brownie will be on the rack, right side up! 6. The condensed milk has a tendency to catch on the bottom of the saucepan which will result in golden bits stirred throughout. Don’t despair if this happens, you will barely notice it once baked. But you do need to whisk consistently to ensure you don’t end up with a sticky, burnt mess in the saucepan! 6. The brownie batter in this recipe is my “go to” brownie. You can make just the brownie if you want! 7. Tablespoon and cup measures differ from country to country. For this recipe, the difference is not enough to impact it. I have made it with both US and Australian/UK measures and could not tell the difference. 8. 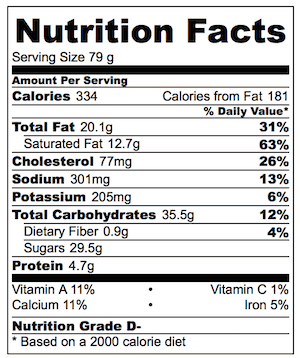 Nutrition per brownie, assuming you cut it into 16 squares as directed, rather than into 4 very large squares (tempting as that might be). I made these last night and they turned out great.Mine look darker than yours so I might take mine off a minute or two before the 7 minutes. Or it may have been because mine had the brown bits in the bottom while it was coming up to a simmer and they may have darkened it (for those making it, these flakes will all break down to where they’re not noticeable by the end (don’t throw it out before it’s done, thinking you’ve ruined it). I used to drive an hour to a bakery that made these and tried to make multiple versions of it at home but never found the right recipe until now! Thank you! Sounds like the heat may of ben slightly too high Cindy, but I’m so glad you love them! Fantastic recipe, even with my blunder, thank you Nagi! I followed all the steps and it all looked fantastic before i put it onto the oven. Unfortunately, after 20 mins of cooking, i noticed the grill was on so the top was nicely grilled! It still tasted fantastic, just a bit more like toffee on the top instead of caramel. I will make it again but without the grill! I have a similar thought to the earlier comment around letting your mixture set a little while you make the caramel. I left the dry mixture on top of the wet while i made the caramel, then mixed the dry and wet together and the mixture and caramel kept nice and separate. Bc of the 1kg Dulce de leche from Argentina as a gift…..all along i have no idea how to use it and was sitting in the fridge since earlier this year…..
Love your one pot recipes as well! Just one quick questions, my caramel wasn’t really pourable and looked like it sunk into the batter when I started placing it on top. Would you know what could’ve gone wrong? Did I overlook it? Shouldn’t I let it cool while I prepare batter? Should I refrigerate my batter next time to make it a bit denser and easier to put my caramel? Should I freeze caramel and then just put chunks of it instead? Video recipe would be amazing!! My brownies turned out yum, almost like the ones on your pictures, even though I cooled the caramel. My coworkers loved it 🙂 Thank you very much for your recipe!! Can these be frozen or will it mess up the caramel? Chocolate salted caramel brownies, YUM!! Mine look nowhere as nice as yours but they are tasty. Love your recipes and you are my go-to when I need some inspiration. Awesome brownie recipe! Will definitely be making this again. Next time I need to cook it longer than 28 minutes. The middle was severely undercooked but the edges were perfect. Also, I made the the salted caramel last so the brownie batter got firmer as it sat and this made it easier for me to spread the remaining brownie batter on top of the salted caramel. 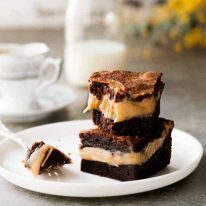 How to achieve perfect, separate layer between brownie and caramel? 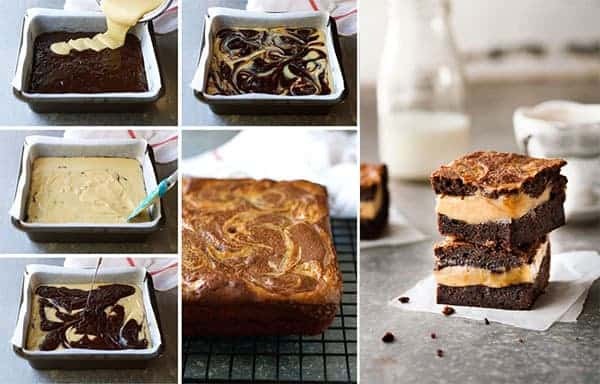 do i have to bake the brownie first before putting the caramel in to the brownie? do you have any tips Nagi?